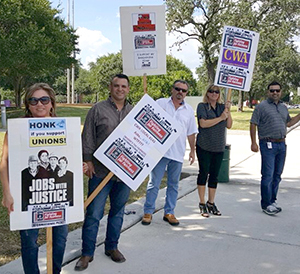 The strike authorization process is underway at AT&T Internet, with CWA members determined to fight back against AT&T's corporate greed and to stand strong for a fair contract. There are about 2,000 workers covered by the NIC. The contract, which expired on July 23, has been extended while mobilization heats up. More than 100 CWAers gathered at AT&T Park in San Francisco during a big two-day Tech Expo sponsored by the company. CWA locals were there to show solidarity and support for bargaining, and to spotlight public attention on AT&T’s refusal to negotiate a fair contract for the workers who have made the company so successful. Negotiations covering 15,000 AT&T CWA members in California and Nevada are continuing. CWA members from California locals were a big part of the action at AT&T's Tech Expo, held at AT&T Park in San Francisco.